It isn’t very often you pick up a book and are immediately transported back into the world of film noir. A forgotten world where the reader can almost “see” the action in their minds’ eye playing out in classic black and white, emphasizing the gritty world of crime with all of its cynical attitudes and sexual motivations. Not to mention, where the main character is the epitome of brawn, brains, and style reminiscent of Bogart, himself. In this new series, Vintage Connor is a retired police officer who worked the harsh streets of Oakland for twenty years in his standard Crown Vic. Now, Connor works in his absolute favorite realm - vintage cars. He is a man who goes to the classic car shows and auctions, and tries to track down the best of the best for his clients. There is a place that is dedicated to classic cars in the summertime - Monterey, California. This is a world of money, trophy wives, rich collectors….and murder. When a young girl is found in a tub in a battered-down motel, the slime that exists in the classic car industry begins to rise to the surface. One evening, Vintage Connor opens his door to see his ex-girlfriend standing on his stoop. Evie is a woman who held Connor’s heart almost twenty years ago, who disappeared from his life when she came to the conclusion that she just couldn’t be a cop’s wife. But on this day, Evie appears from the past to beg Connor for his help in solving her daughter’s murder. Evie's daughter was a lovely girl working in Monterey who would NEVER have committed suicide - even though that’s what the cops labeled the crime, and then closed the case. Never being able to turn Evie down, Connor gets involved and utilizes his old partner, as he throws himself headfirst into the rich, powerful world of Monterey. As Connor moves stealthily through the odd world, he comes across people who he’s met before, and begins to unravel a mystery full of yachts, call girls, and blackmail. Not only does Connor get imbedded in this murky realm, he also has to fight to separate his feelings from his well-honed cop instinct. Evie still owns his heart, yet Connor must deal with the fact that, in the end, Evie may not be an innocent player in this crime. It has been quite a long time in the literary world since an author has written solid “crime fiction” that mirrors the heyday of the genre. From the graceful yachts filled to the brim with criminals, blackmailers, call girls, and alcohol - to the run-down motel rooms where the grungy walls hold the secrets to a very serious crime - each and every paragraph draws the reader in and makes it impossible for them to put this book down until the crime is solved! 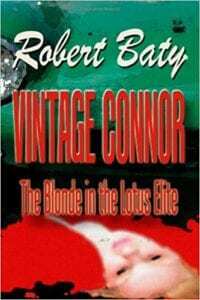 This is the first in the line of Vintage Connor books, and because of the powerful and very descriptive writing, as well as the character of Vintage, himself - this is only the first in a VERY long line of incredible crime fiction to come. Quill Says: A great, entertaining, fascinating story that introduces a wonderful new character to the world of crime fiction. Not to mention…the classic cars are ‘drool-worthy,’ to say the least!